On Friday the second It's Sew Easy Episode that I appear in will be airing @ itsseweasytv.com. In. this episode, I will be demonstrating using the Scan N Cut machine to cut your applique pieces as well as how to print a template for manually cutting applique pieces. Be sure to tune in. It will be available for free for 7 days. Secondly, I am trying to move my blog back to my own website. I have not been satisfied with the commenting on either site. I am trying a new technique on both platforms for a bit (there will be duplicate content) to see which one works best. I really want this to be interactive. 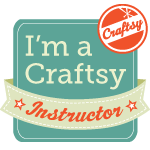 I have left the discount link on my website for the Craftsy class active on my Home page for the rest of the week since last week was Memorial Day weekend. I have been getting good feedback from it so far. I hope you will enjoy it and as always hope you find it informative and helpful! I think I have finally found a way to enable commenting for the blog feature through my website tonight. If this works, I will move it back here to keep my life a little less complicated. Let's keep our fingers crossed. I really want this to be an interactive method of communication! If someone would please post a comment on the blog, I would greatly appreciate it!